Canned beans are healthy additions to any of your meals. Canned beans are usually low in saturated fat and calories, but contain high fiber content. A diet high in fiber can help ensure your bowel movements are regular. A high-fiber diet may also reduce your risk of heart disease and diabetes. According to the Institute of Medicine, women should eat 25 grams of fiber a day, while men should consume 38 grams a day. Pinto beans, or legumes, are available dry or canned. Refried beans, common in Mexican foods, are a form of mashed pinto beans. You can add pinto beans in a number of different dishes, including tacos, burritos or soups. Pinto beans are high in fiber. One cup of canned pinto beans contains 18.8 grams of fiber. Pinto beans nearly have no fat, no sodium and no cholesterol. They are also high in protein and a good source of iron. Canned kidney beans are high in fiber. 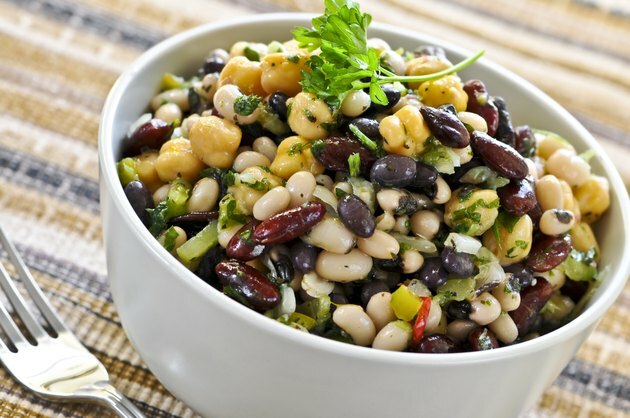 A half-cup serving of kidney beans provides you with approximately 9 grams of fiber. Kidney beans, like other legumes, contain no fat or cholesterol and are low in calories. Some canned kidney beans are high in sodium but many companies offer a low-sodium alternative. Canned kidney beans are a good source of protein and iron as well. You can add canned kidney beans, or red beans, to different meals such as soups, stews or chili. Combining kidney beans with rice is another option. Black beans are another healthy canned bean that is high in fiber. One cup of cooked black beans provides you with over 19 grams of fiber. Black beans are low in fat and calories. These legumes are a good source of iron and protein and contain folic acid and potassium. Canned black beans may be high in sodium so, for the healthiest option, choose a low- or no-sodium brand. You can add black beans to stews and soups, or enjoy them with rice for a fiber rich and filling meal. Canned baked beans are often navy or white beans. Vegetarian baked beans are covered in a meatless tomato sauce. Consuming a serving size of one-half cup of baked beans will yield 5 grams of dietary fiber. These beans alone have less than 1 gram of fat and are low in calories. The canned variety may be high in sodium, however, depending on the brand. Baked beans are also a good source of protein and iron. You can serve baked beans as a side dish or add to a dip or casserole.